I have been off travelling for a few weeks so I haven’t had much time to work on Northcourt Mk2 but I did decide to replace the old flimsy plastic valve sockets with new ceramic sockets so that’s what I did today. When I decided to rip out the old sockets, I didn’t think that the diameter of the new sockets is 4mm larger than the holes cut for the old sockets (22mm rather than 18mm). Oops! I first thought of using a reamer to enlarge the holes but I couldn’t find many reamers large enough and most were too expensive for my tastes. I was also a bit worried about how long it would take to ream out that large a hole by hand. The solution that I eventually settled on was a stepped drill bit. It was cheap (less than £10) and large enough (just) to cut a 22mm hole. 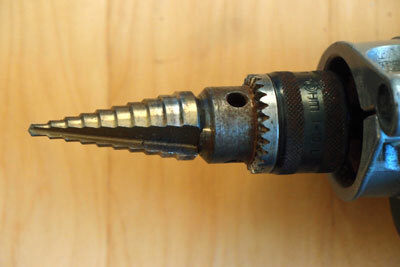 I tried to use a battery powered drill with speed-control but that did not have enough torque so kept stalling. In the end I used my old Bosch but it was hard to control and the enlarged holes are not particularly neat as you can see from the picture. 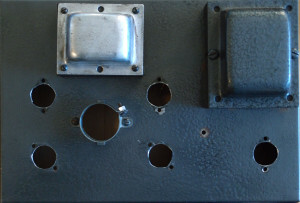 Nevertheless, the job was done quickly and, when the valve sockets are in place, the ragged edges will not show. I’m not sure if I will use this approach again but it produced an acceptable result.